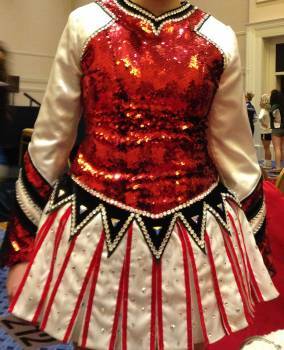 This Siopa Rince dress has a red sequin bodice, white satin sleeves with red sequins and black velvet on the cuff,and a white satin skirt with red velvet stripes. With tons of crystals! This dress is stunning! Out sparkles any dress on stage! I am very critical, this dress is actually in EXCELLENT condition! Only “flaw” is some slight pulls on the sleeves from the sequins. This is not visible unless you are looking for it. The only reason we are selling is because my daughter has grown. My daughter is 5’4.